Glenn Irwin is targeting his first victory of the season at Brands Hatch on Sunday after a crash hampered his prospects at Donington Park. The PBM Be Wiser Ducati rider came off in practice in the Bennetts British Superbike Championship season opener during the Easter Bank Holiday weekend, aggravating an old neck injury. Irwin was able to continue at Donington and finished sixth and seventh, despite being left on the back foot after missing some track time as a result of his crash. On Friday, the Carrick rider was sixth quickest in free practice at the Indy circuit as team-mate Shane Byrne topped the times by 0.175 seconds from James Ellison (Anvil Hire TAG Yamaha), with Christian Iddon third fastest on the Tyco BMW, only 0.220 seconds behind Byrne. The top six were covered by just 0.280 seconds and Irwin is eager to challenge at the front after his setback at Donington. “I’m looking forward to the weekend. 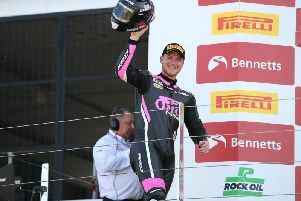 It wasn’t the easiest start to the season at Donington and to be honest it was a bit weird because after the crash the next day I was back out and I was feeling happy, particularly with our result in race two,” he said. “I do struggle a bit in those conditions when it is a bit unfavourable so a seventh place felt good, all things considered. “The grid position made it tough for race one but I knew we had good pace. I think with the crash and the conditions I was a bit detuned and the main thing for me was not to crash and get some good points, because after the crash even scoring points didn’t look like it would have been an option,” added the Ulsterman. “I think we can come out fighting for wins on the Indy circuit. Last year we had good pace there and I had been catching the leaders hand over fist before I crashed and I know we have improved since then. “I think one of my strong points is that I still have good pace even when the tyre goes off and I think the Indy circuit tends to work for me. Michael Laverty (Tyco BMW) was 13th fastest in FP2 with Carl Phillips 25th on the Gearlink Kawasaki. Bradley Ray, who won both races at Donington on the Bennetts Suzuki, was down in 17th place on day one. Superpole qualifying takes place from 4:05pm on Saturday, with race one scheduled for 1:30pm on Sunday and race two at 4:30pm. In the Pirelli National Superstock 1000 class, Keith Farmer was second fastest on the Tyco BMW in FP2, only 0.182 seconds behind Billy McConnell (Bennetts Suzuki). Andy Reid, who sealed an emotional debut win in the series at Donington, was third on the EHA Aprilia, with fellow Northern Ireland riders Josh Elliott (Morello Kawasaki) and Alastair Seeley (WD40 Kawasaki) in sixth and seventh respectively. The first race will be held on Saturday 2pm. Jack Kennedy was fastest in Supersport practice, with David Allingham the leading Ulsterman in eighth on the EHA Yamaha. Tobermore’s Adam McLean, who has joined McAdoo Racing for the roads this season, impressed in the Superstock 600 class as he set the second fastest time, 0.177 seconds off the top. Eunan McGlinchey was second quickest in qualifying for the British Junior Supersport races.